In the previous chapter we studied the vocabulary and equations that describe motion. Now we will learn why things move the way they do; this is the subject of dynamics. An interaction between two bodies—a push or a pull—is called a force. If you lift a book, you exert an upward force (created by your muscles) on it. If you pull on a rope that’s attached to a crate, you create a tension in the rope that pulls the crate. When a skydiver is falling through the air, Earth is exerting a downward pull called gravitational force, and the air exerts an upward force called air resistance. When you stand on the floor, the floor provides an upward, supporting force called the normal force. If you slide a book across a table, the table exerts a frictional force against the book, so the book slows down and then stops. Static cling provides a directly observable example of the electrostatic force. Protons and neutrons are held together in the nuclei of atoms by the strong nuclear force and radioactive nuclei decay through the action of theweak nuclear force. The Englishman Sir Isaac Newton published a book in 1687 called Philosophiae Naturalis Principia Mathematica (The Mathematical Principles of Natural Philosophy)—referred to nowadays as simply The Principia—which began the modern study of physics as a scientific discipline. Three of the laws that Newton stated in The Principia form the basis for dynamics and are known simply as Newton’s Laws of Motion. Newton’s First Law says that an object will continue in its state of motion unless compelled to change by a net force impressed upon it. That is, unless an unbalanced force acts on an object, the object’s velocity will not change: If the object is at rest, then it will stay at rest; and if it is moving, then it will continue to move at a constant speed in a straight line. Basically, no net force means no change in velocity. This property of objects, their natural resistance to changes in their state of motion, is called inertia. In fact, the First Law is often referred to as the Law of Inertia. The mass of an object is the quantitative measure of its inertia; intuitively, it measures how much matter is contained in an object. Two identical boxes, one empty and one full, have different masses. The box that is full has the greater mass, because it contains more stuff; more stuff, more mass. Mass is measured in kilograms, abbreviated as kg. (Note: An object whose mass is 1 kg weighs about 2.2 pounds.) It takes twice as much force to produce the same change in velocity of a 2 kg object than of a 1 kg object. Mass is a measure of an object’s inertia, its resistance to acceleration. A force of 1 kg·m/s2 is renamed 1 newton (abbreviated as N). A medium-size apple weighs about 1 N.
This is the law that’s commonly remembered as, to every action, there is an equal, but opposite, reaction. More precisely, if Object 1 exerts a force on Object 2, then Object 2 exerts a force back on Object 1, equal in strength but opposite in direction. These two forces, F1-on-2 and F2-on-1, are called an action/reaction pair. While the forces in an action/reaction are equal in magnitude, the ‘reaction’ (i.e., the resulting acceleration of the object) depends on the mass of each object. The greater the mass, the smaller the ‘reaction’ (acceleration); the smaller the mass, the greater the ‘reaction’ (acceleration). Example 1 What net force is required to maintain a 5000 kg object moving at a constant velocity of magnitude 7500 m/s? Solution. The First Law says that any object will continue in its state of motion unless a force acts on it. Therefore, no net force is required to maintain a 5000 kg object moving at a constant velocity of magnitude 7500 m/s. Here’s another way to look at it: Constant velocity means a = 0, so the equation Fnet = ma immediately gives Fnet = 0. Example 2 How much force is required to cause an object of mass 2 kg to have an acceleration of 4 m/s2? Solution. According to the Second Law, Fnet = ma = (2 kg)(4 m/s2) = 8 N.
Example 3 An object feels two forces; one of strength 8 N pulling to the left and one of strength 20 N pulling to the right. If the object’s mass is 4 kg, what is its acceleration? Solution. Forces are represented by vectors and can be added and subtracted. Therefore, an 8 N force to the left added to a 20 N force to the right yields a net force of 20 – 8 = 12 N to the right. Then Newton’s Second Law gives a = Fnet/m = (12 N to the right)/(4 kg) = 3 m/s2 to the right. Mass and weight are not the same thing—there is a clear distinction between them in physics—but they are often used interchangeably in everyday life. The weight of an object is the gravitational force exerted on it by Earth (or by whatever planet it happens to be on). Mass, by contrast, is an intrinsic property of an object that measures its inertia. An object’s mass does not change with location. Put a baseball in a rocket and send it to the Moon. The baseball’s weight on the Moon is less than its weight here on Earth (because the Moon’s gravitational pull is weaker than Earth’s due to its much smaller mass), but the baseball’s mass would be the same. 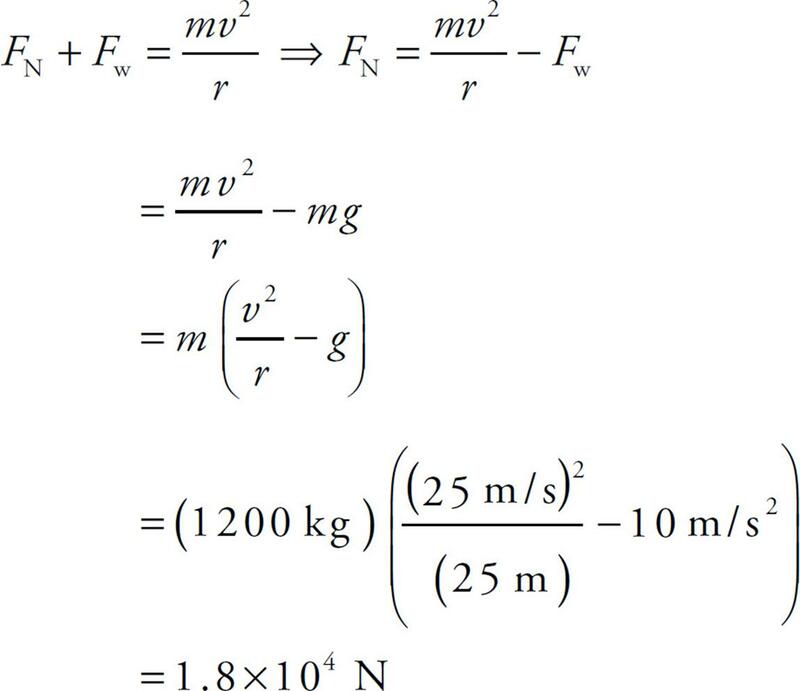 This is the equation for the weight of an object of mass m. (Fg and Fw are both commonly used to represent the force of gravity. Weight is often symbolized merely by w, rather than Fw.) Notice that mass and weight are proportional but not identical. Furthermore, mass is measured in kilograms, while weight is measured in newtons. Example 4 What is the mass of an object that weighs 500 N? Example 5 A person weighs 150 pounds. Given that a pound is a unit of weight equal to 4.45 N, what is this person’s mass? Example 6 A book whose mass is 2 kg rests on a table. Find the magnitude of the force exerted by the table on the book. Solution. The book experiences two forces: The downward pull of Earth’s gravity and the upward, supporting force exerted by the table. Since the book is at rest on the table, its acceleration is zero, so the net force on the book must be zero. Therefore the magnitude of the support force must equal the magnitude of the book’s weight, which is Fw = mg = (2 kg)(10 m/s2) = 20 N.
Example 7 A can of paint with a mass of 6 kg hangs from a rope. If the can is to be pulled up to a rooftop with an acceleration of 1 m/s2, what must the tension in the rope be? Solution. First draw a picture. Represent the object of interest (the can of paint) as a heavy dot, and draw the forces that act on the object as arrows connected to the dot. This is called a free-body (or force) diagram. Example 8 A can of paint with a mass of 6 kg hangs from a rope. If the can is to be pulled up to a rooftop with a constant velocity of 1 m/s, what must the tension in the rope be? Solution. The phrase “constant velocity” automatically means a = 0 and, therefore, Fnet = 0. In the diagram above, FT would need to have the same magnitude as Fw in order to keep the can moving at a constant velocity. Thus, in this case, FT = Fw = mg = (6)(10) = 60 N.
Example 9 How much tension must a rope have to lift a 50 N object with an acceleration of 10 m/s2? Example 10 A book whose mass is 2 kg rests on a table. Find the magnitude of the normal force exerted by the table on the book. When an object is in contact with a surface, the surface exerts a contact force on the object. The component of the contact force that’s parallel to the surface is called the friction force on the object. Friction, like the normal force, arises from electrical interactions between atoms of which the object is composed and those of which the surface is composed. We’ll look at two main categories of friction: (1) static friction and (2) kinetic (sliding) friction. If you attempt to push a heavy crate across a floor, at first you meet with resistance, but then you push hard enough to get the crate moving. The force that acted on the crate to cancel out your initial pushes was static friction, and the force that acts on the crate as it slides across the floor is kinetic friction. Static friction occurs when there is no relative motion between the object and the surface (no sliding); kinetic friction occurs when there is relative motion (when there’s sliding). Note that the equation for the strength of the static friction force is for the maximum or lesser value. This is because static friction can vary, precisely counteracting weaker forces that attempt to move an object. For example, suppose an object feels a normal force of FN = 100 N and the coefficient of static friction between it and the surface it’s on is 0.5. Then, the maximum force that static friction can exert is (0.5)(100 N) = 50 N. However, if you push on the object with a force of, say, 20 N, then the static friction force will be 20 N (in the opposite direction), not 50 N; the object won’t move. The net force on a stationary object must be zero. Static friction can take on all values, up to a certain maximum, and you must overcome the maximum static friction force to get the object to slide. The direction of Fkinetic friction = Ff (kinetic) is opposite to that of motion (sliding), and the direction of Fstatic friction = Ff (static) is opposite to that of the intended motion. Example 11 A crate of mass 20 kg is sliding across a wooden floor. The coefficient of kinetic friction between the crate and the floor is 0.3. (a) Determine the strength of the friction force acting on the crate. (b) If the crate is being pulled by a force of 90 N (parallel to the floor), find the acceleration of the crate. Solution. First draw a free-body diagram. In part (a) F = 0, and in part (b) F = 90 N for our free-body diagram. Reminder: Separate the horizontal and vertical forces and use ΣFx = max and ΣFy = may. (a) The normal force on the object balances the object’s weight, so FN = mg = (20 kg)(10 m/s2) = 200 N. Therefore, F(kinetic) = μkFN = (0.3)(200 N) = 60 N.
(b) The net horizontal force that acts on the crate is F – Ff = 90 N – 60 N = 30 N, so the acceleration of the crate is a = Fnet/m = (30 N)/(20 kg) = 1.5 m/s2. Example 12 A crate of mass 100 kg rests on the floor. The coefficient of static friction is 0.4. If a force of 250 N (parallel to the floor) is applied to the crate, what’s the magnitude of the force of static friction on the crate? Solution. 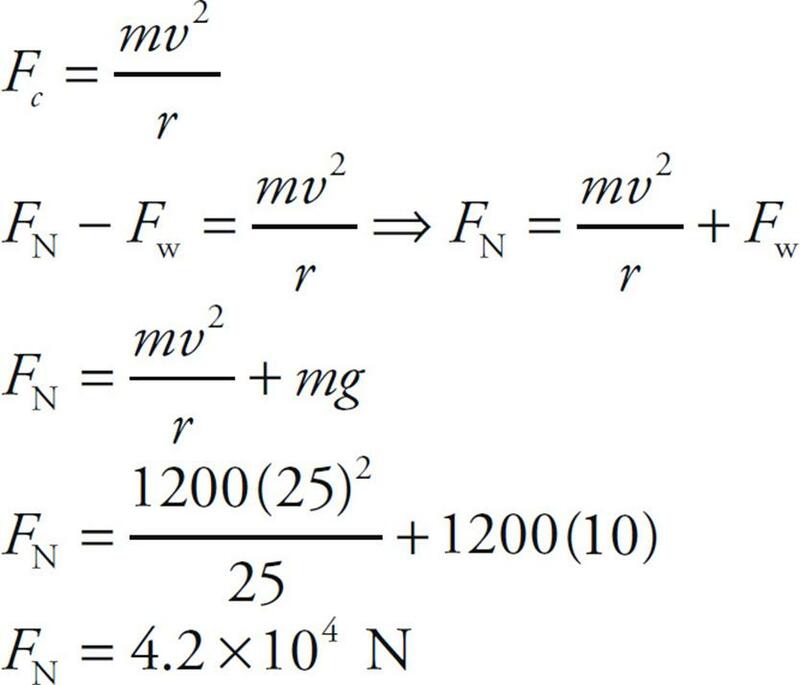 The normal force on the object balances its weight, so FN = mg = (100 kg)(10 m/s2) = 1,000 N. Therefore, Fstatic friction, max = Ff (static), max = μsFN = (0.4)(1,000 N) = 400 N. This is the maximum force that static friction can exert, but in this case it’s not the actual value of the static friction force. Since the applied force on the crate is only 250 N, which is less than the Ff (static), max, the force of static friction will be less also: Ff (static) = 250 N, and the crate will not slide. Pulleys are devices that change the direction of the tension force in the cords that slide over them. Here we’ll consider each pulley to be frictionless and massless, which means that their masses are so much smaller than the objects of interest in the problem that they can be ignored. 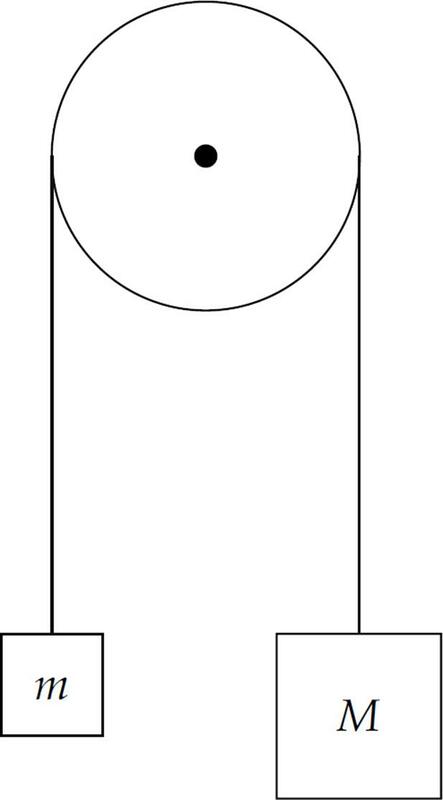 Example 13 In the diagram above, assume that the tabletop is frictionless. Determine the acceleration of the blocks once they’re released from rest. Solution. There are two blocks, so we draw two free-body diagrams: The positive directions for each block must coincide. 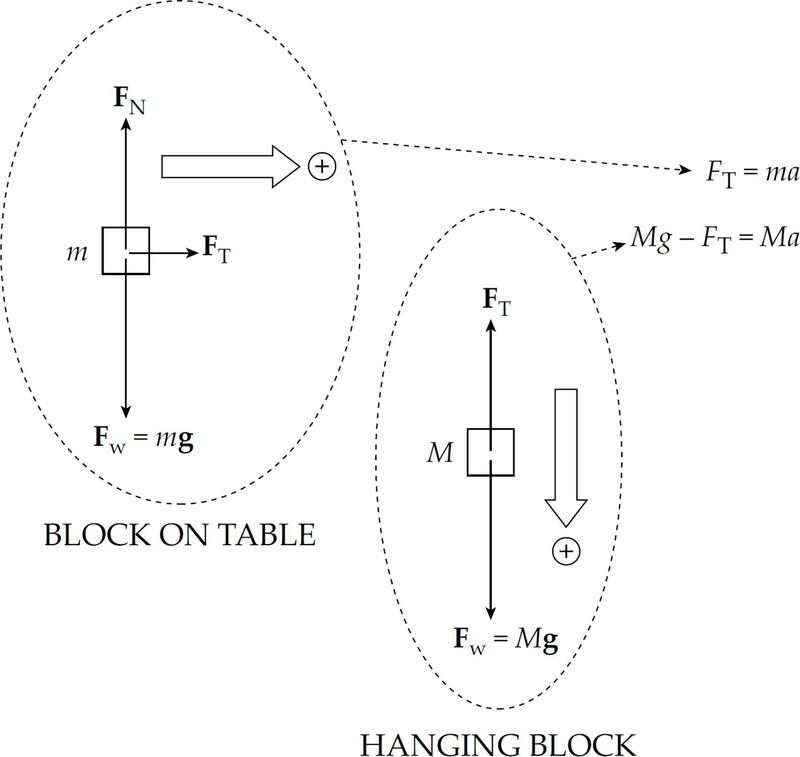 If the block on the table travels to the right then the hanging block travels down. This is why down is positive for the hanging block. To get the acceleration of each one, we use Newton’s Second Law, Fnet = ma. Note that there are two unknowns, FT and a, but we can eliminate FT by adding the two equations, and then we can solve for a. Example 14 Using the same diagram as in the previous example, assume that m = 2 kg, M = 10 kg, and the coefficient of kinetic friction between the small block and the tabletop is 0.5. Compute the acceleration of the blocks. Solution. Once again, draw a free-body diagram for each object. 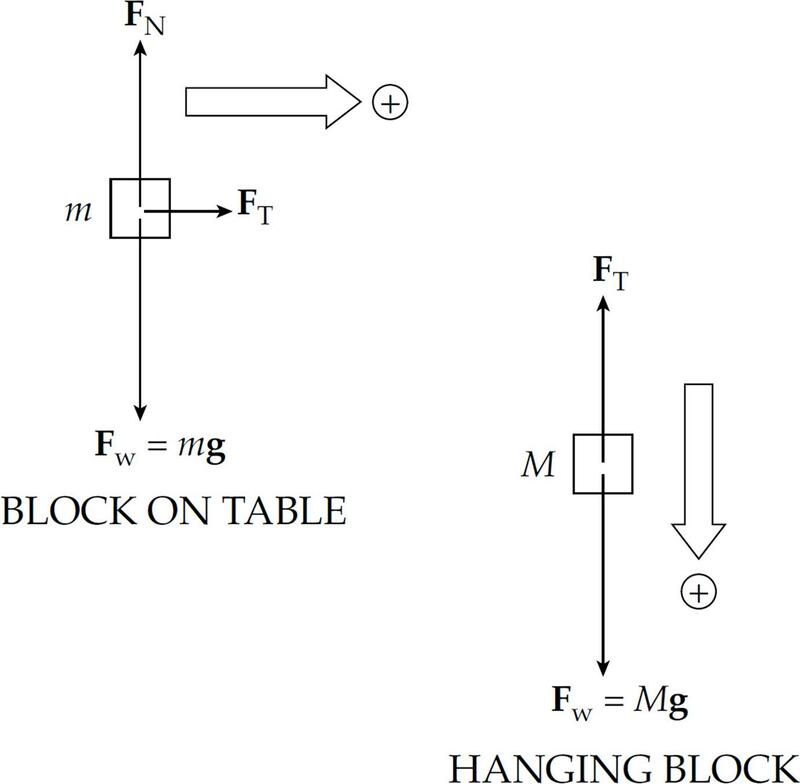 Note that the only difference between these diagrams and the ones in the previous example is the inclusion of the force of (kinetic) friction, Ff, that acts on the block on the table. Substituting in the numerical values given for m, M, and μ, we find that a = g (or 7.5 m/s2). Example 15 In the previous example, calculate the tension in the cord. An inclined plane is basically a ramp. If an object of mass m is on the ramp, then the force of gravity on the object, Fw = mg, has two components: One that’s parallel to the ramp (mg sin θ) and one that’s normal to the ramp (mg cos θ), where θ is the incline angle. The force driving the block down the inclined plane is the component of the block’s weight that’s parallel to the ramp: mg sin θ. When analyzing objects moving up or down inclined planes it is almost always easiest to rotate the coordinate axes such that the x-axis is parallel to the incline and the y-axis is perpendicular to the incline, as shown in the diagram. The object would accelerate in both the x- and y-directions as it moved down along the incline if you did not rotate the axis. However, with the rotated axes the acceleration in the y-direction is zero. Now we only have to worry about the acceleration in the x-direction. Example 16 A block slides down a frictionless, inclined plane that makes a 30° angle with the horizontal. Find the acceleration of this block. Example 17 A block slides down an inclined plane that makes a 30° angle with the horizontal. If the coefficient of kinetic friction is 0.3, find the acceleration of the block. In Chapter 4, we considered two types of motion; straight-line motion and parabolic motion. We will now look at motion that follows a circular path, such as a rock on the end of a string, a horse on a merry-go-round, and (to a good approximation) the Moon around Earth and Earth around the Sun. Let’s simplify matters and consider the object’s speed around its path to be constant. This is called uniform circular motion. You should remember that although the speed may be constant, the velocity is not, because the direction of the velocity is always changing. Since the velocity is changing, there must be acceleration. 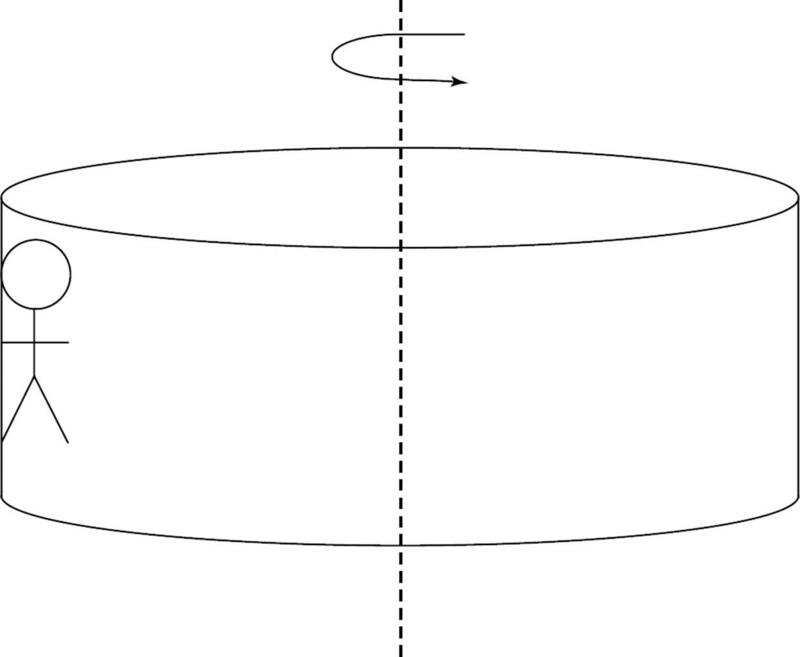 This acceleration does not change the speed of the object; it only changes the direction of the velocity to keep the object on its circular path. Also, in order to produce an acceleration, there must be a force; otherwise, the object would move off in a straight line (Newton’s First Law). 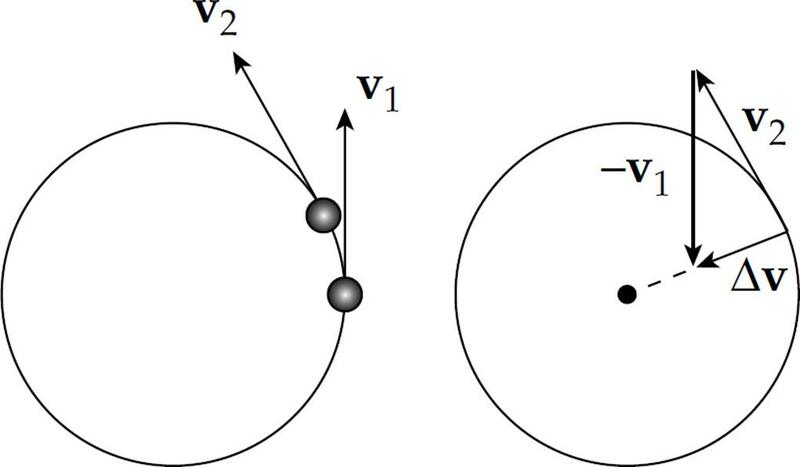 The figure on the left on the next page shows an object moving along a circular trajectory, along with its velocity vectors at two nearby points. The vector v1 is the object’s velocity at time t = t1, and v2 is the object’s velocity vector a short time later (at time t = t2). The velocity vector is always tangential to the object’s path (whatever the shape of the trajectory). Notice that since we are assuming constant speed, the lengths of v1 and v2 (their magnitudes) are the same. When this is given on the free response equation sheet, it is given in terms of angular velocity as well, which will be discussed later. Example 18 An object of mass 5 kg moves at a constant speed of 6 m/s in a circular path of radius 2 m. Find the object’s acceleration and the net force responsible for its motion. 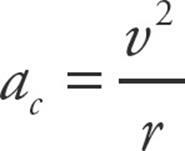 This equation gives the magnitude of the force. As for the direction, recall that because F = ma, the directions of F and a are always the same. Since centripetal acceleration points toward the center of the circular path, so does the force that produces it. Therefore, it’s called centripetal force. Centripetal force is provided by everyday forces such as tension, friction, gravity, or normal forces. 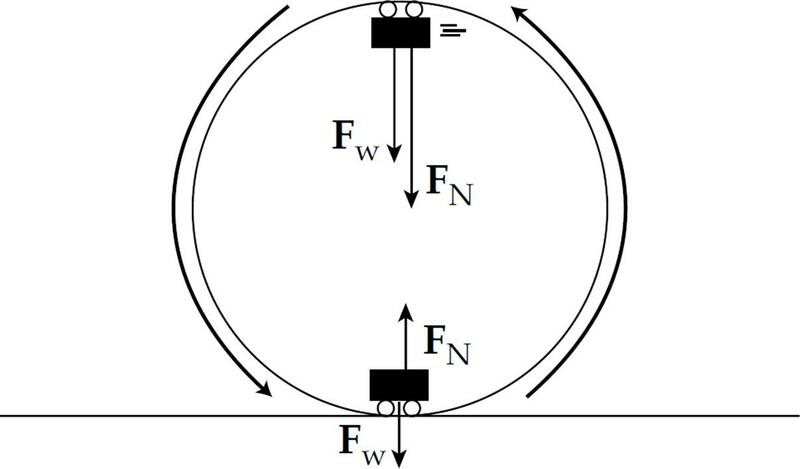 The centripetal force acting on this object has a magnitude of Fc = mac = (5 kg)(18 m/s2) = 90 N.
Two common types of circular motion are offered here. The diagrams on the next page show examples of a ball on a string traveling in a horizontal circle and a vertical circle. Example 19 A 10 kg mass is attached to a string that has a breaking strength of 200 N. If the mass is whirled in a horizontal circle of radius 80 cm, what maximum speed can it have? Assume the string is horizontal. Example 20 An athlete who weighs 800 N is running around a curve at a speed of 5.0 m/s in an arc whose radius of curvature, r, is 5.0 m. Assuming his weight is equal to the force of static friction, find the centripetal force acting on him. What could happen to him if r were smaller? In this case, static friction provides the centripetal force. Since his weight is equal to the force of static friction, this means the coefficient of static friction between his shoes and the ground is 1, so the maximum force that static friction can exert is μsFN ≈ FN = Fw = 800 N. Fortunately, 800 N is greater than 400 N. But notice that if the radius of curvature of the arc were much smaller, then Fc would become greater than what static friction could handle, and he would slip. Example 21 A roller-coaster car enters the circular-loop portion of the ride. At the very top of the circle (where the people in the car are upside down), the speed of the car is 25 m/s, and the acceleration points straight down. If the diameter of the loop is 50 m and the total mass of the car (plus passengers) is 1200 kg, find the magnitude of the normal force exerted by the track on the car at this point. Also find the normal force exerted by the track on the car when it is at the bottom of the loop. Assume it is still traveling 25 m/s at that location as well. Solution. 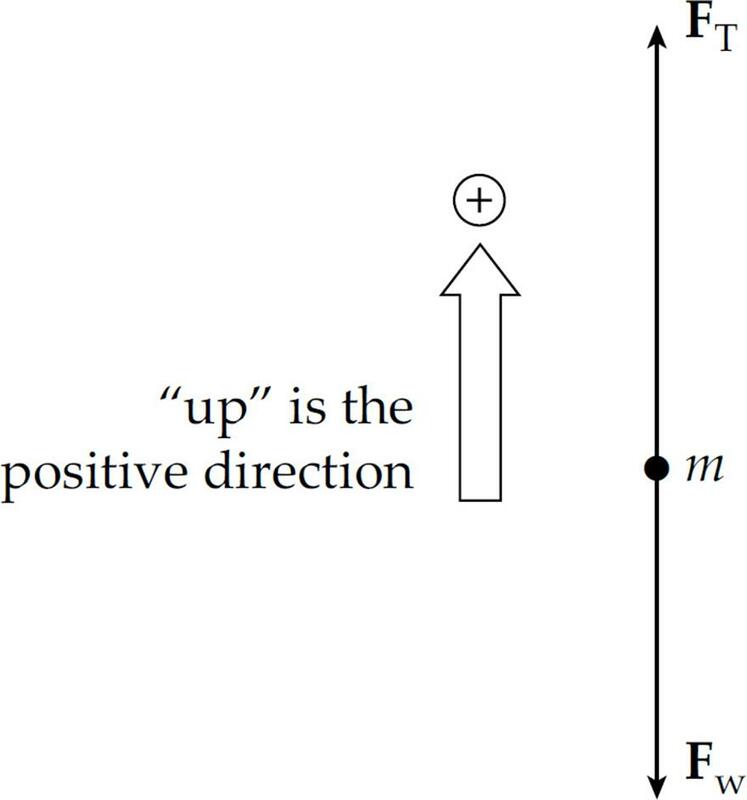 When analyzing circular motion, consider all forces pointing toward the center to be positive and all forces pointing away to be negative. There are two forces acting on the car at its topmost point: the normal force exerted by the track and the gravitational force, both of which point downward. Now we will determine the normal force exerted by the track on the car at the bottom of the loop. Notice that the normal force is much greater when the car is at the bottom of the track than when it is at the top. When it is at the top of the track, gravity is helping the car travel in a circle. Example 22 In the previous example, if the net force on the car at its topmost point is straight down, why doesn’t the car fall straight down? Solution. Remember that force tells an object how to accelerate. If the car had zero velocity at this point, then it would certainly fall straight down, but the car has a non-zero velocity (to the left) at this point. The fact that the acceleration is downward means that, at the next moment, vwill point down to the left at a slight angle, ensuring that the car remains on a circular path, in contact with the track. The minimum centripital acceleration of the car at the top of the track would be equal to the acceleration of gravity, g = 9.8 m/s2. If ac were less than g then the car would fall off its circular path. 2. A person who weighs 800 N steps onto a scale that is on the floor of an elevator car. If the elevator accelerates upward at a rate of 5 m/s2, what will the scale read? 3. A frictionless inclined plane of length 20 m has a maximum vertical height of 5 m. If an object of mass 2 kg is placed on the plane, which is the net force it feels? 4. A 20 N block is being pushed across a horizontal table by an 18 N force. If the coefficient of kinetic friction between the block and the table is 0.4, find the acceleration of the block. 5. The coefficient of static friction between a box and a ramp is 0.5. The ramp’s incline angle is 30°. If the box is placed at rest on the ramp, the box will do which of the following? (A) Accelerate down the ramp. (B) Accelerate briefly down the ramp but then slow down and stop. (C) Move with constant velocity down the ramp. (E) Cannot be determined from the information given. 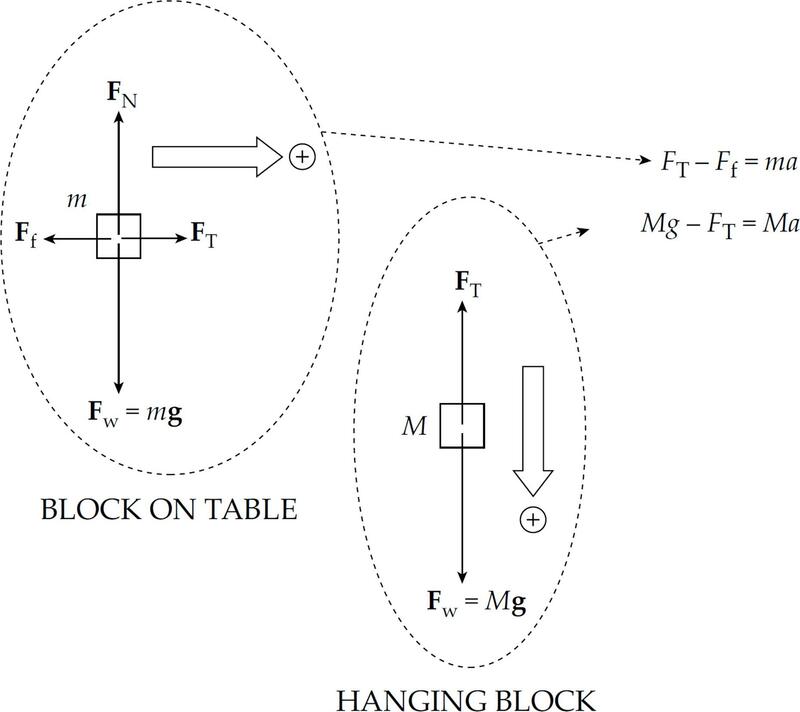 Assuming a frictionless, massless pulley, determine the acceleration of the blocks once they are released from rest. 9. A crate of mass 100 kg is at rest on a horizontal floor. The coefficient of static friction between the crate and the floor is 0.4, and the coefficient of kinetic friction is 0.3. A force F of magnitude 344 N is then applied to the crate, parallel to the floor. Which of the following is true? (A) The crate will accelerate across the floor at 0.5 m/s2. (B) The static friction force, which is the reaction force to F as guaranteed by Newton’s Third Law, will also have a magnitude of 344 N.
(C) The crate will slide across the floor at a constant speed of 0.5 m/s. (D) The crate will not move. 10. An object moves at constant speed in a circular path. Which of the following statements is/are true? I. The velocity is constant. II. The acceleration is constant. III. The net force on the object is zero. A 60 cm rope is tied to the handle of a bucket which is then whirled in a vertical circle. The mass of the bucket is 3 kg. 11. At the lowest point in its path, the tension in the rope is 50 N. What is the speed of the bucket? 12. What is the critical speed below which the rope would become slack when the bucket reaches the highest point in the circle? 13. An object moves at a constant speed in a circular path of radius r at a rate of 1 revolution per second. What is its acceleration? 1. This question concerns the motion of a crate being pulled across a horizontal floor by a rope. 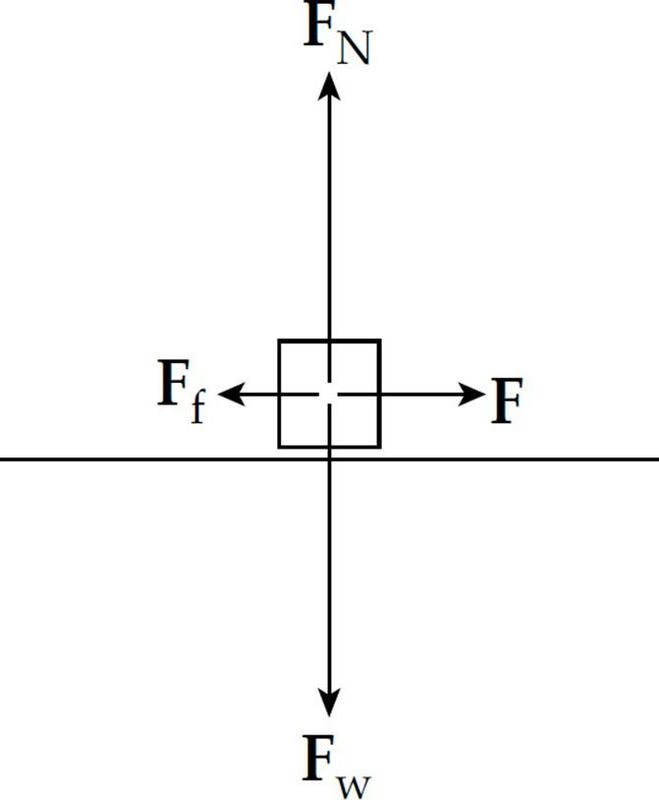 In the diagram below, the mass of the crate is m, the coefficient of kinetic friction between the crate and the floor is μ, and the tension in the rope is FT.
(a) Draw and label all of the forces acting on the crate. (b) Compute the normal force acting on the crate in terms of m, FT, θ, and g.
(c) Compute the acceleration of the crate in terms of m, FT, θ, μ, and g.
(d) Assume that the magnitude of the tension in the rope is fixed but that the angle may be varied. For what value of θ would the resulting horizontal acceleration of the crate be maximized? Solve for the following in terms of given quantities. (a) Draw and label all of the forces acting on Block #1. (b) Draw and label all of the forces acting on Block #2. (c) What is the acceleration of Block #1? (d) What is the tension in the string connecting the two blocks? (ii) the difference between the strength of the force that the connecting string exerts on Block #2 and the strength of the force that the connecting string exerts on Block #1. 3. 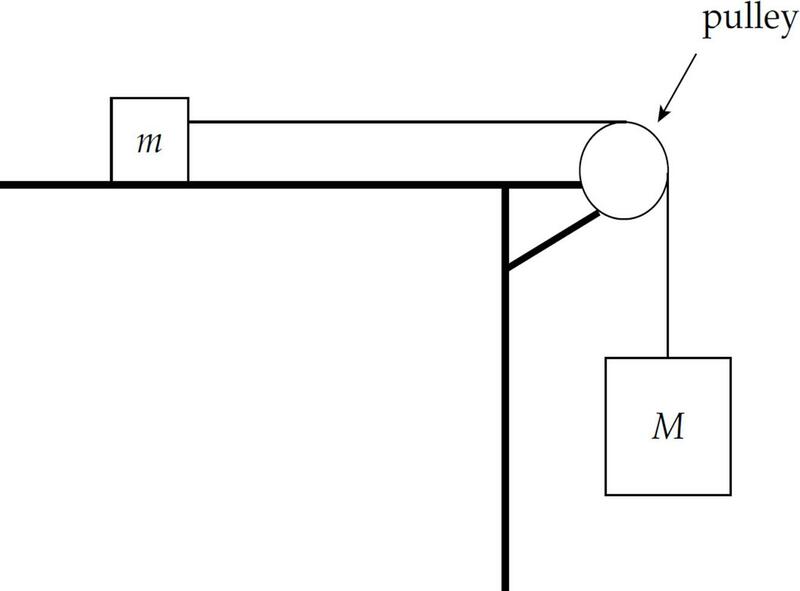 In the figure shown, assume that the pulley is frictionless and massless. Solve for the following in terms of given quantities and the acceleration of gravity, g.
(ii) slide up the ramp at constant speed. 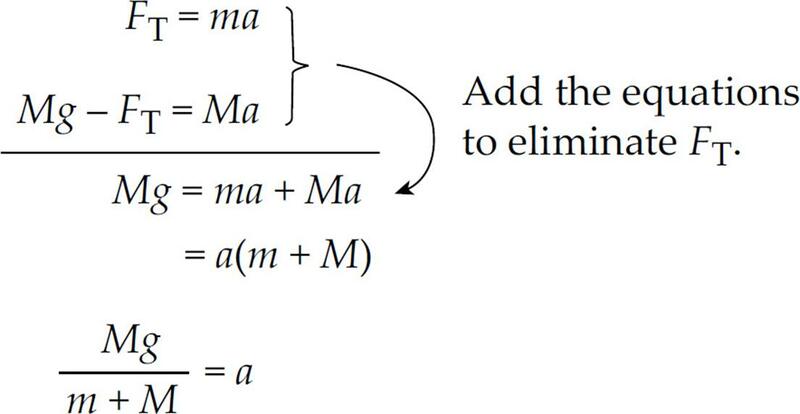 (b) If the coefficient of kinetic friction between the surface of the inclined plane and the box of mass m1 is μk, derive (but do not solve) an equation satisfied by the value of θ which will cause the box of mass m1 to slide up the ramp at constant speed. 4. A sky diver is falling with speed v0 through the air. At that moment (time t = 0), she opens her parachute and experiences the force of air resistance whose strength is given by the equation F = kv, where k is a proportionality constant and v is her descent speed. The total mass of the sky diver and equipment is m. Assume that g is constant throughout her descent. (a) Draw and label all the forces acting on the sky diver after her parachute opens. (b) Determine the sky diver’s acceleration in terms of m, v, k, and g.
(c) Determine the sky diver’s terminal speed (that is, the eventual constant speed of descent). (d) Sketch a graph of v as a function of time, starting at t = 0 and going until she lands, being sure to label important values on the vertical axis. (e) Derive an expression for her descent speed, v, as a function of time t since opening her parachute in terms of m, k, and g.
5. An amusement park ride consists of a large cylinder that rotates around its central axis as the passengers stand against the inner wall of the cylinder. Once the passengers are moving at a certain speed v, the floor on which they were standing is lowered. Each passenger feels pinned against the wall of the cylinder as it rotates. Let r be the inner radius of the cylinder. (a) Draw and label all the forces acting on a passenger of mass m as the cylinder rotates with the floor lowered. (b) Describe what conditions must hold to keep the passengers from sliding down the wall of the cylinder. (c) Compare the conditions discussed in part (b) for an adult passenger of mass m and a child passenger of mass m/2. 6. A curved section of a highway has a radius of curvature of r. The coefficient of friction between standard automobile tires and the surface of the highway is μs. (a) Draw and label all the forces acting on a car of mass m traveling along this curved part of the highway. (b) Compute the maximum speed with which a car of mass m could make it around the turn without skidding in terms of μs, r, g, and m.
City engineers are planning on banking this curved section of highway at an angle of θ to the horizontal. (c) Draw and label all of the forces acting on a car of mass m traveling along this banked turn. Do not include friction. (d) The engineers want to be sure that a car of mass m traveling at a constant speed v (the posted speed limit) could make it safely around the banked turn even if the road were covered with ice (that is, essentially frictionless). Compute this banking angle θ in terms of r, v, g, and m.
Newton’s First Law (Law of Inertia) states that objects will continue in their state of motion unless acted upon by an unbalanced force. Newton’s Third Law states that whenever two objects interact, the force the first object exerts on the second object is equal to, but in the opposite direction of, the force the second object exerts on the first object. The weight of an object is given by Fw = mg. The normal force is the component of the contact force exerted on an object in contact with a surface and is perpendicular to the surface. The normal force can be represented by FN or N.
Friction is the component of the contact force exerted on an object in contact with a surface and is parallel to the surface. 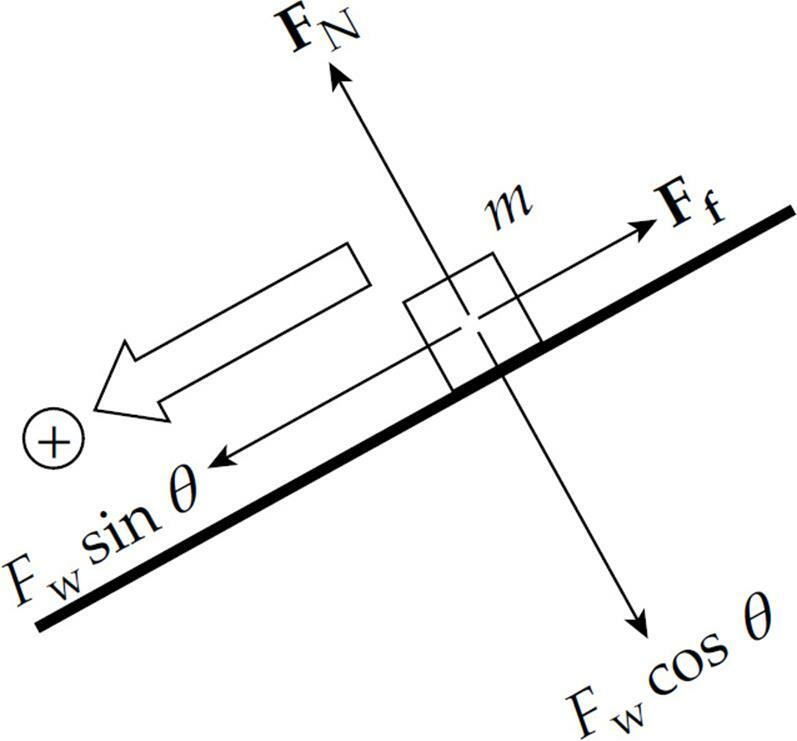 There are two components to the force of gravity on an object on an inclined plane: the force parallel to the ramp (mg sin θ) and the force normal to the ramp (mg cos θ). To simplify analysis of an object moving up or down a ramp, rotate the coordinate axes so that the x-axis is parallel to the incline and the y-axis is perpendicular to the incline. 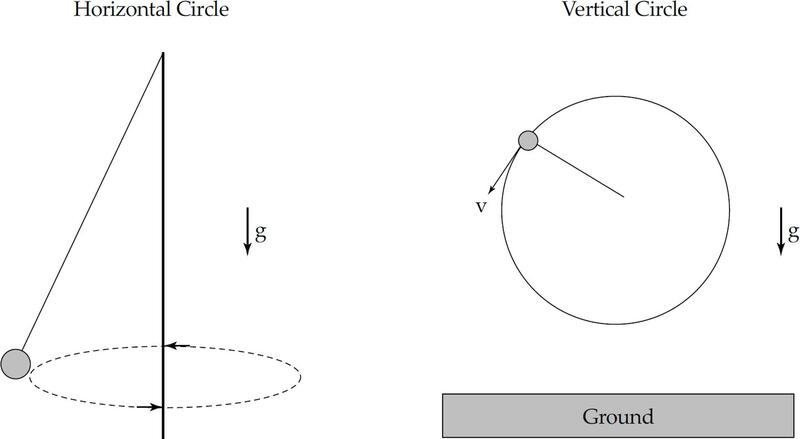 The velocity vector is tangent to the circle. The centripetal acceleration points toward the center of the circle, and therefore the centripetal force must also point to the center of the circle.